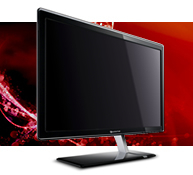 Sporting a stylish, contemporary design, the Maestro LED HD is the thinnest Maestro monitor ever. 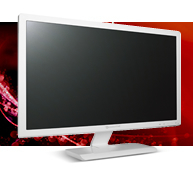 This slender monitor features a 21.5, 23 or 24-inches widescreen and portrays gorgeous graphics in Full HD resolution. It can also display HD video content from any HD device. The LED panel is mercury-free and uses less power than traditional LCDs, so it's very environmentally friendly. At just 16.5 mm, this ultra-slim monitor looks splendid in pure white. 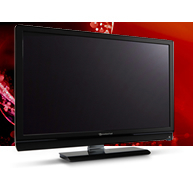 It reveals stunning graphics in Full HD resolution, and provides flexible connectivity options for easy use. Slim and stylish, the Maestro TV supports computer input and a hybrid TV-tuner that plays back HD TV and MPEG-4, for splendid entertainment. Adding to the great versatility are recording and time-shifting features, so you never miss a beat. To top it off, this TV is also environmentally friendly.